"An easy tasty recipe for cheesy potatoes. Great for potlucks or the holidays when oven space is limited! It can easily be doubled if you have a larger slow cooker." Grease your slow cooker with cooking spray or shortening. 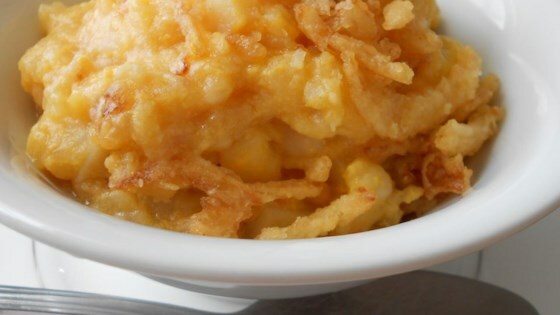 In a large bowl, stir together the hash browns, cheese soup, evaporated milk, and half of the French fried onions. Pour into the slow cooker. Cover, and cook on High for 4 hours, or Low for 8 hours. Top with remaining onions just before serving. I fixed this for Easter and it was the first dish gone...no leftovers! It was so easy and didn't take up oven space! I had a brunch for 18 people and this recipe was awesome since my oven was full. I let it cook for nine hours, and since i doubled the recipe, it worked out great. will make again for sure!